Joy Creek Photo Archive (c) all rights reserved Aruncus dioicus is also known as goats beard. 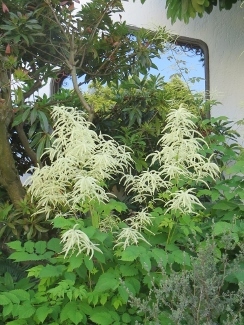 Above its many branching stems rise large panicles of white flowers which give the overall plant a large feathery appearance. For the waterside or woodland garden. Found throughout the N. Hemisphere. Late spring into early summer. 7 ft. x 1 ft.-4 ft.